Many experienced growers will tell you that with tobacco, a dry season will scare you but a wet season can kill you. 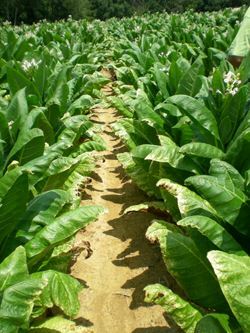 There is some basis to this, as the tropical origin of tobacco likely makes the crop much more tolerant of drought than of excessive moisture. We have seen both extremes in the last two years with the extreme drought of 2012 and the wet season of 2013. See table 1 for a summary of rainfall totals during the tobacco field season (April to September) in 2013 compared to 2012. The 50-year historical average rainfall for April-September for most areas of the dark tobacco production area of west Kentucky and Tennessee is about 23.75 inches. As shown in Table 1, rainfall at Princeton, Mayfield, and Russellville KY was well below this historical average, and was less than half of this average at Mayfield. 2013 was a major contrast, with all three locations having well above average rainfall for this period, and Russellville having nearly twice the average. With tobacco, a wider variety of weather-related problems occur in a wet season compared to a dry season, so several things are worth remembering for the next wet season. Beginning early in the year when ground preparation starts, risks of soil compaction are more likely in a wet season. Soil compaction has been more common regardless of rainfall in the past several years, as tobacco farms have gotten larger and growers have more acreage to cover, resulting in more of a tendency to work ground when it is too wet. Significant soil compaction can occur as shallow as 6-inches or less from the soil surface even with relatively small equipment and implements used on soil that is too wet to work. Under these conditions, tobacco may develop healthy roots laterally from the root ball and from the stem above the root ball with very little root growth downward due to the compacted zone. A good method to determine if the ground is too wet to work is to form a soil ball in your hand. If the soil remains as a firm ball when you release it, the soil is likely too wet to work. Even without soil compaction, tobacco does not develop as extensive of a root system in a wet year as it does in a dry year, particularly with a wet early season when roots develop the most. In a wet season where water is readily available, the plant is not forced to develop a larger root system to search for water. The result is a crop with a relatively shallow root system that is more prone to lodging in wind later in the season, and also susceptible to showing a multitude of nutrient deficiencies, even when ample nutrients are available. As the plant grows, the limited root system physically cannot keep up with the rapid top growth of the plant. 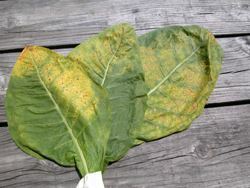 Potassium deficiency is most common under these conditions, but phosphorus deficiency symptoms may also occur (see images). 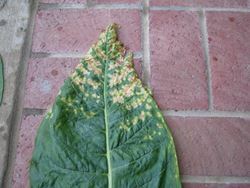 During a wet season like 2013, tobacco may even appear to be showing nitrogen deficiency symptoms of yellowing from the bottom of the plant upward. The first reaction of growers seeing these symptoms is to add more nitrogen or more of whatever nutrient appears to be limiting. Most often the deficiency is temporary and the crop recovers over time without additional fertilizer, or the root system is so small that no amount of additional fertilizer would cause significant recovery. 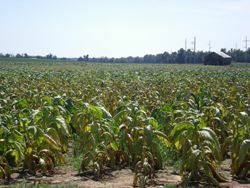 In Kentucky, nitrogen losses should be minimal even in wet seasons when tobacco is grown on soils that are well drained but not too sandy. Adding additional nitrogen, particularly after layby at 5 weeks or so after transplanting can be more detrimental to the crop than any nitrogen deficiency symptoms, resulting in rank growth later in the season, increased potential for green cured leaf, and possible increases tobacco-specific nitrosamines (TSNA). Water damaged tobacco compounded by black shank.